After 14 years, the 2nd Edition to David Sibley's Guide to Birds is finally on shelves. Exactly like the 1st edition, the 2nd edition covers 27 species of gulls. The genera have been updated to reflect current taxonomic nomenclature (from 5 genera to 8 genera). All of the tern-like gulls have been moved to the beginning according to their rankings (except Ivory Gull), while the large gulls are pushed to the back. 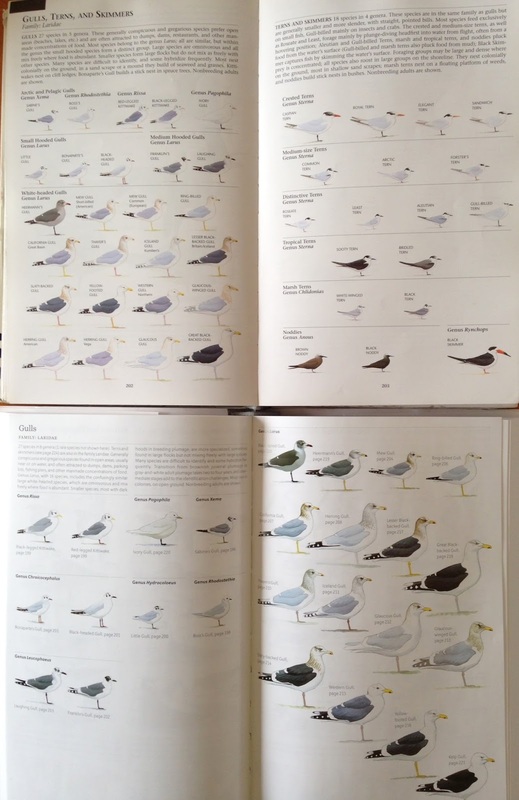 Different than the 1st edition, the family introduction in the 2nd edition now displays the gull species on two pages (pp.196-197), and they now appear more proportionally drawn to scale. 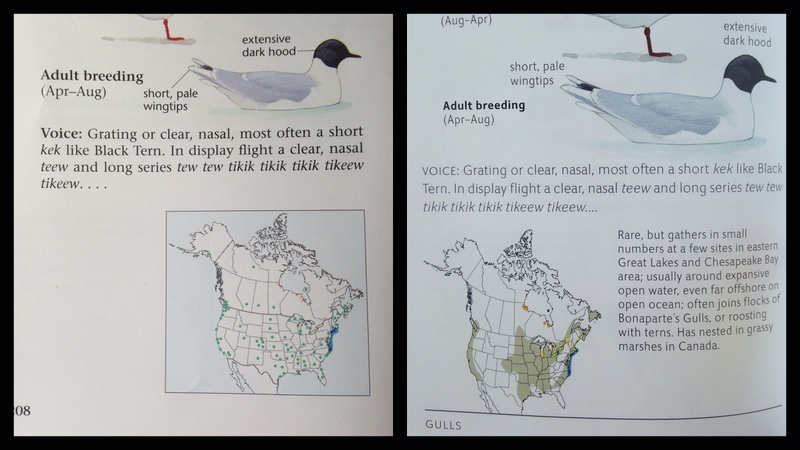 One minor mistake that should have been caught before going to press is the titles on Black-tailed Gull and Heermann's Gull being switched (on p. 197) -- no biggie. Note, Black-tailed was not included in the family introduction in the 1st edition. Praise-worthy and a step up, I immediately noticed that most of the upperpart colors in the 2nd edition are more true-to-life, with truer grays, as opposed to the purplish-blue hues of the old edition. However, there are some color issues that are disturbing. The Laughing Gull appears too dark, as does the Slaty-backed and Heermann's Gull (which is also depicted as a bulky and blocky-looking bird). Frankly, I feel the 1st edition did these 3 species more justice. Despite the gulls being in basic plumage and non-breeding condition, the reds appear too dark and maroon-like (consider the gonys spots, for instance, or the bills on some of the hooded gulls). The pink legs on the large white-headed gulls are grossly washed out. Slaty-backed Gull and Thayer's Gull are shown with brownish-gray legs. These color problems will hopefully be restored in the next printing. It could be my personal copy, but I couldn't help but notice that the Iceland Gull now appears darker than the Thayer's to its left (when in fact it should be the other way around). Appreciable, the hybrid plates of various large white-headed gulls are still included, but are now moved to the end of the gull section, which makes more sense. In addition, a plate depicting an adult Lesser Black-backed x American Herring (so-called Appledore Gull) has been added just below the Yellow-legged Gull plates. I thought this was much needed and I'm very pleased this increasing hybrid received more attention. With that said, the legs could stand to benefit from being a bit duller or even blended with pink tones. The bill looks akwardly small as well. 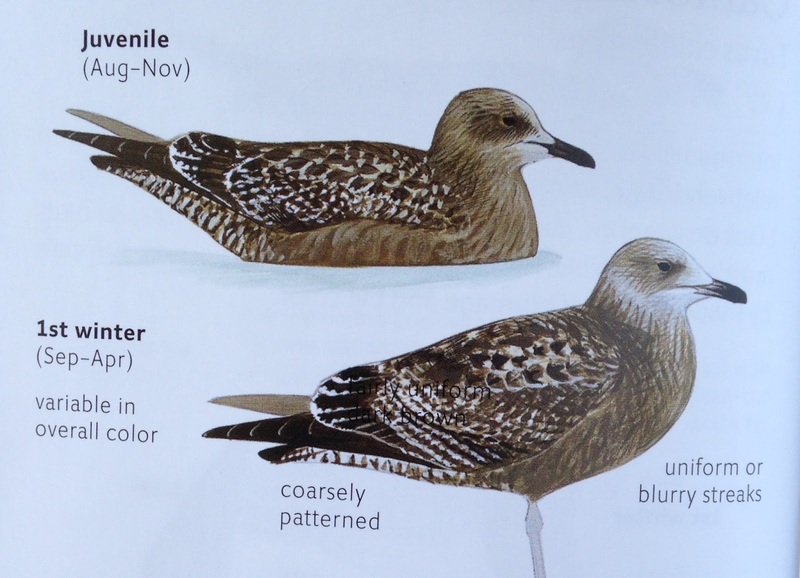 One thing I was hoping to see in the new edition was juvenile plumages that appeared more crisp, patterned, and checkered where appropriate (such as some of the northern breeders -- specifically the white-wingers and the black-backed gulls). in late summer through early fall. Although I realize Sibley's need to depict wear and fading, and the difficulty in combining this effect with the "first winter" plates (as some species have already begun to show formative or alternate feathers), I feel a family such as the gulls is deserving of one extra plate. Overall, most of the juvenile plates look smudgy and more blotted when compared to the 1st edition (the same can be said about many of the intermediate ages as well). I must say, in general, I'm not very impressed by the gull plates. appears random and somewhat chicken-scratched. This is also the case on a good deal of the adult plates. I didn't notice any significant changes with the voice descriptions (or the "long call postures"), but the author can't take blame for this as there hasn't been much published on this aspect of gulls in the last few decades. New notes have been inserted in the species accounts where neccessary. 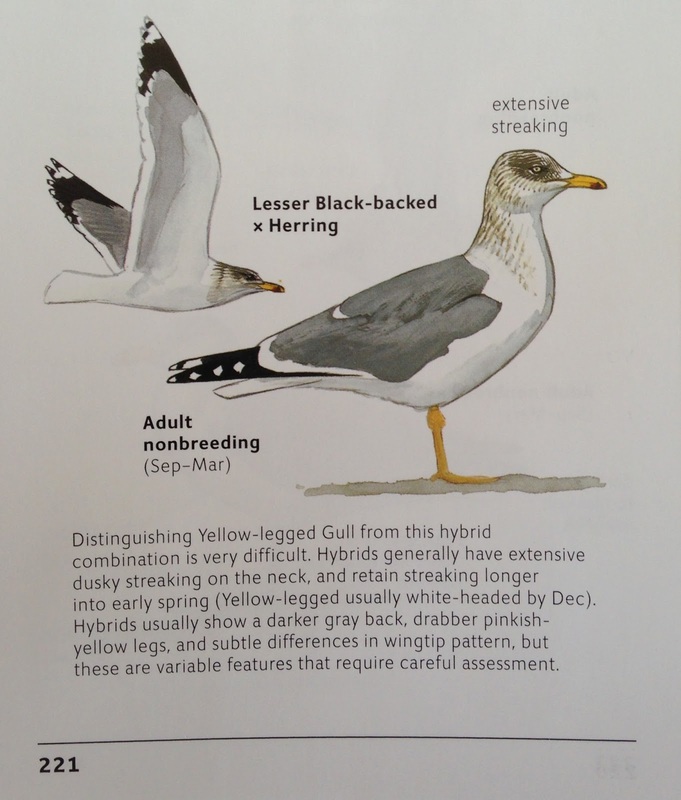 For instance, Sibley now notes that adult Western Gulls can take on yellow legs in early spring -- a detailed observation that no general field guide has included before. Overall, I feel the updated range maps, along with the pertinent notes and comments adjacent to the maps, should be reason enough to want this edition. 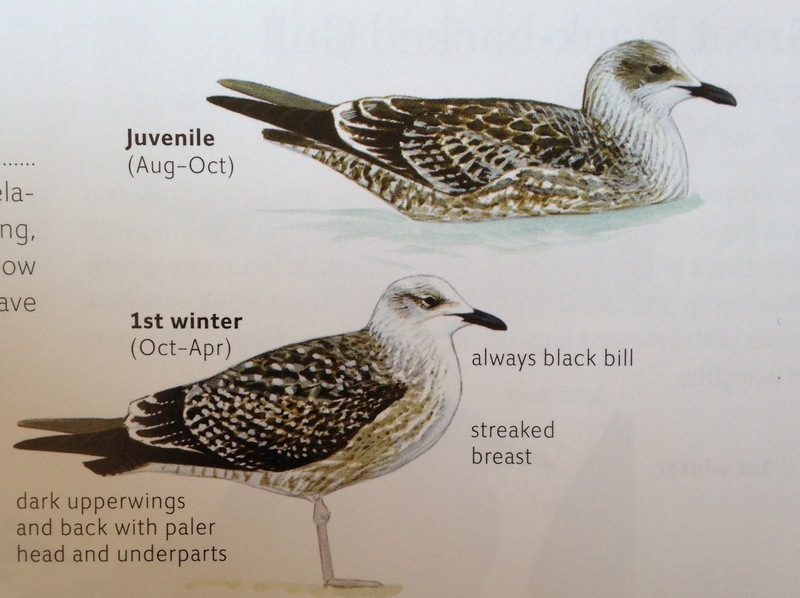 The single column on "Gull Identification" on p. 200, along with the "Gull Topography" and "Bare Parts" plates (on pp. xxi and xxii) will be helpful for the beginning birder. But for identification purposes, and from a gull enthusiast's perspective, I don't feel the plates in the 2nd edition make gull identification any easier. 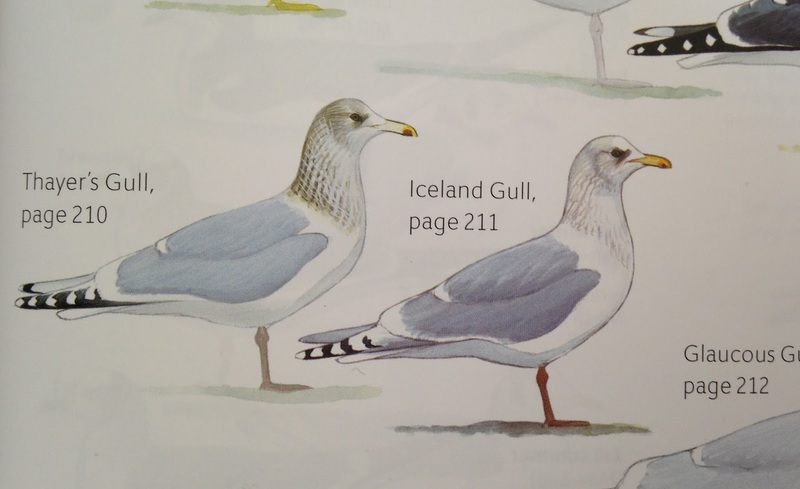 In fact, in some ways, the average birder may feel the 2nd edition makes gulls appear even more intimidating. I do want to end with emphasizing that this review is specifically on the gull section, and is not at all to be applied to the entire guide. Gulls could be a very tough family to draw and paint, and at the end, granted some color corrections take place, I think the gull accounts in David Sibley's 2nd addition are impactful. David Sibley's most recent work verifies that he's still one of the most impeccable artists of North American birds!